So my person decided to celebrate the day by making me some homemade ice cream. At least I thought she was making me some homemade ice cream. She started cooking up all the ingredients. It smelled good, but there was something missing. I wanted to make sure my person hadn’t forgotten the special ingredient so I asked her if she remembered to put the fish in. She looked at me really funny. I guess that means she forgot. I tried to convince her that there was still time to put it in and she told me there were no fish in Mexican Chocolate ice cream. That sounds like a flavor for a Chihuahua – not for a big dog like me. I tried to explain to my person that since she was making this ice cream for me she should make my favorite flavor. And you know what she told me? 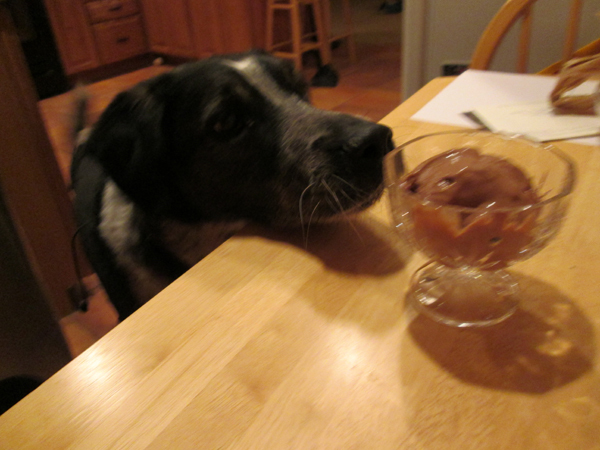 My person said this was not National Dog Ice Cream Day and Mexican Chocolate is my younger person’s favorite flavor. And since my younger person is home for the weekend my person is making his favorite flavor to celebrate National Ice Cream Day. My younger person isn’t even here right now. He’s over at a friend’s. I’m here. Don’t you think you should make the favorite flavor of the one who stays home and hangs out with you? I jumped up and down and did everything I could to try to convince my person to make my favorite flavor. And then you know what she told me? Dogs aren’t allowed to eat chocolate. Bongo! Say it ain’t so! What a mean, mean momma! First she won’t tell let Jesus give you fish, then she won’t give you fish! And you know what? I don’t think Jones chews makes any fish treats. Hmm … I’m going to have to talk to someone about that. FleaByte, I can’t figure out why my person hardly ever gives me fish, but at least I got a little bit of that chocolate ice cream I wasn’t supposed to have. But if you could come up with some special fish treats that would be awesome. Well Bongo, maybe next time. I eat every kind of ice cream I can get my paws on & even though I’m not supposed to have chocolate, Diane lets me have one little spoonful (I am an ample girl after all). Lola, I did get a little bit of that ice cream. Some dripped off the spoon onto the floor – and of course I had to clean the floor. And then my person actually put a little bit into my bowl. Oh yeah, and while my person was gone this morning I stole the freezer thing off the counter and licked it. Don’t tell though. Good job Bongo – so everything’s all clean. I try to help out around here too. Marina, I did get a little taste and it was really good. But I think I’ll have to send my person to the pet store to see if she can find me some doggy chocolate fish flavor. I’m not sure about chocolate fish but it could be a fish shaped doggy chocolate?!!! Mmmm… ice cream… we celebrated too but instead we made a cherry sorbet, strawberry lemon sorbet and a watermelon sorbet… all were very yummy! Emily, those sorbets sound really good too. Did you make any fish flavored sorbet? Unfortunately no, there isn’t any fish flavored sorbet… we’ll have to save that one for another time I think! Bacon, work really hard to talk your mom into making ice cream. I did get a little taste and it’s really good. Thanks sounds great. Thanks for the advice. If Molly likes it, it’s gotta be good. Not sure about RC though. Little Binky, I’m getting after my person right now. That whipped cream sounds extra special. P.S. I did get a little taste of that ice cream – but don’t tell anybody. Your Mom is right unfortunately, we’re not allowed chocolate, but I agree with you, there are SO many other flavors she could make for you too!! Snoopy, I’m putting up a loud protest. If I’m persistent enough my person will have to make another flavor. Benny & Lily, I did get a little taste. It was really good. I don’t know how you put up with her?! Maybe now she has practiced on the chocolate she can make you some special ice cream?! Dalton, I did get a little taste of that chocolate, but I’m working on my person to make me a flavor I can have a big bowl of. Molly and Alfie, frozen yogurt and banana sounds yummy! I’m going to tell my person about it right now. Chocolate ice cream is great, but I sure would like my person to make me a flavor I can eat bunches of. Kevin, my person doesn’t make homemade ice cream very often, but she found this recipe and it’s really good. 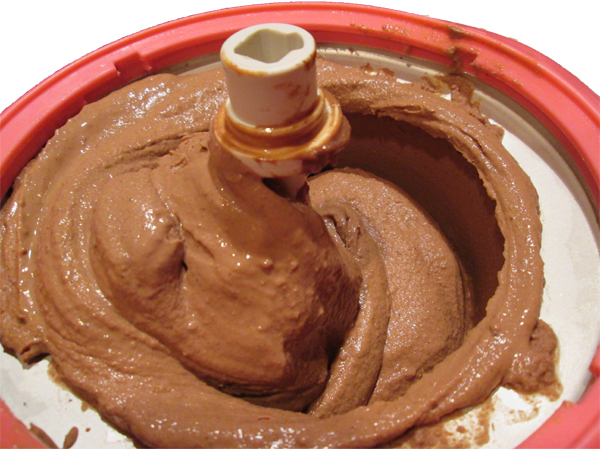 The ice cream needs to be churned up while it’s freezing to have good texture and that’s what this machine does. The inside part goes in the freezer ahead of time and there’s liquid in it that freezes and then freezes the ice cream. My person also has a big ice cream maker that’s electric, but it needs lots of ice and rock salt to freeze the ice cream. What a bummer. That whole no-chocolate-for-dogs rule STINKS! I hope your ice cream is your person’s very next creation. Make the sad face. That should work. Cupcake, I think my person should make me my own ice cream for having to put up with so much thunder lately. I’ll give her the thunder sad face. I think that might work. Your mom is dreadfully narrow-minded: humans, humans, humans… National Ice Cream Day should mean that National Dogs’ Ice Cream Day & National Lions’ Ice Cream Day & National Bears’ Ice Cream Day etc. etc. Kolytyi, you’re so right. Everybody should be allowed to celebrate National Ice Cream Day. hmmmph! Humans… making a flavor we dogs can’t eat. See if you share with her anymore…. Collies, I think I’ll make my own ice cream next time. And eat all of it myself. Well, if you guys come over I’ll share some with you.